Flourishing in the Mahendragarh district of Haryana, Narnaul is a popular historic city and is also known to be very rich in mineral resources, such as iron ore, copper, calcite and quartz. Amongst tourists, it has gained recognition as the place where the epic battle of 1857 between the British army and Rao Tula Ram, one of the strongest leaders during the uprising, was fought. This unforgettable battle is considered to be one of the most popular and fierce battles against the British army. Hence, Narnaul has become a popular weekend spot amongst history lovers today. As the history of this town dates back to several centuries, you can find several ancient monuments within its boundaries. Due to its location in the vicinity of Jaipur, it is a perfect weekend destination for tourists who look forward to exploring the glorious past of India. So, how about a trip from Jaipur to Narnaul this weekend? If you are keen on getting in touch with the ancient lanes of Narnaul, then read on to know more about how to reach Narnaul and its tourist spots. The best time to visit Narnaul is from October until the end of February. During this period, the weather is pleasant and cool, thereby, letting you roam around comfortably. As it experiences hot summers, it is a less frequented destination during the summer season. However, for history lovers, Narnaul is a year-round destination. By Air: As the nearest airport to Narnaul is located in Jaipur, there is no option of accessing Narnaul by air if you are travelling from Jaipur. Therefore, hiring a direct cab is the best way to reach Narnaul. By Rail: Narnaul has a good rail connectivity but there are no direct trains available from Jaipur to Narnaul. Hence, you need to take a train to Rewari Junction from Jaipur and then from there, another train to Narnaul. Rewari is located at a distance of about 190 km from Jaipur and 60 km from Narnaul. By Road: One can easily access Narnaul by road. You can either hire a direct cab or catch a direct bus to Narnaul from Jaipur. Route 1 is preferable as it will take half an hour lesser in comparison to the other route, thereby, helping you reach Narnaul within 3 h 30 min. Once you are on your way, you can take a break at Kotputli and explore its beautiful temples and other beautiful sites. Kotputli is located at a distance of about 117 km from Jaipur and 60 km from Narnaul and therefore, it is a perfect spot for a break. Even though there are not many places to explore within its boundaries, it is still one of the preferable en route destinations for tourists. Famous for temples, Kotputli is home to more than 20 temples. Wouldn't you love to explore these religious sites and soothe your mind amidst their peaceful environment? The major temples here include Bada Mandir, Talab Wala Shiv Mandir, Avadhbihari Mandir, Parshuram Mandir and Gayatri Mata Mandir. Narnaul is located at an approximate distance of 170 km from Jaipur and hence, it can be reached within 3 h, thereby, making it a perfect weekend getaway for history lovers. Apart from historical monuments, you can also indulge in savouring the divine aura of its beautiful temples. Following are the major places which you must visit on your trip to Narnaul. One of the most visited historical monuments, Jal Mahal is a small palace built in the midst of Khan Sarovar Lake and dates back to the late 16th century, when Akbar was ruling the Mughal kingdom. With beautiful architecture and a commendable structural formation, this ancient beauty was built by Nawab Shah Quli Khan and is a must-visit destination for you. Wouldn't you love to explore its age-old complex, sit by its surrounding tank and get lost in the pages of history? 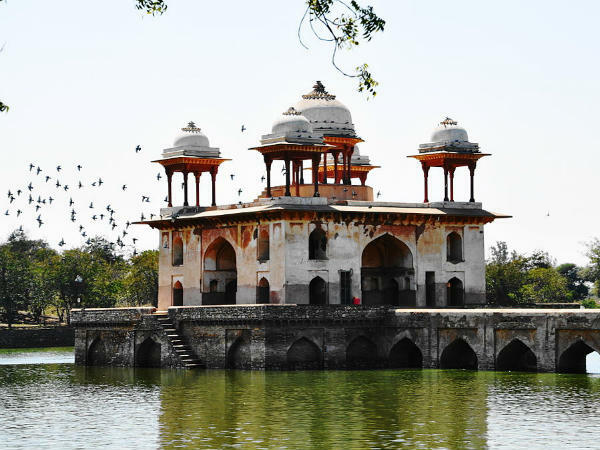 Another magnificent monument, Birbal Ka Chhatta is a historical monument which was built by Rai Bal Mukund Das, the minister of Narnaul, during the period of the Mughal Emperor Shah Jahan in the early 17th century. With beautiful rooms and grand halls, it is a five-storey building and allures several architecture enthusiasts too. The presence of a beautiful fountain in the compound of the monument adds to its existing beauty. As per local legends, it is also believed that Birbal Ka Chhatta had several tunnels in the past which opened in Jaipur and were used by Emperor Akbar and Minister Birbal. If you desire to get yourself to a peaceful place where you can just enjoy the silence of Narnaul, then you must visit Khalda Wale Hanuman. Dedicated to Lord Hanuman, this beautiful temple is located on a hillock and is visited by hundreds of locals and seasonal tourists every month. If you think you are not satisfied after exploring the grandeur and majesty of the above-discussed places, then you can also plan to contemplate the beauty of several other historical places which include Chor Gumbad and Mirza Alijan Baori.